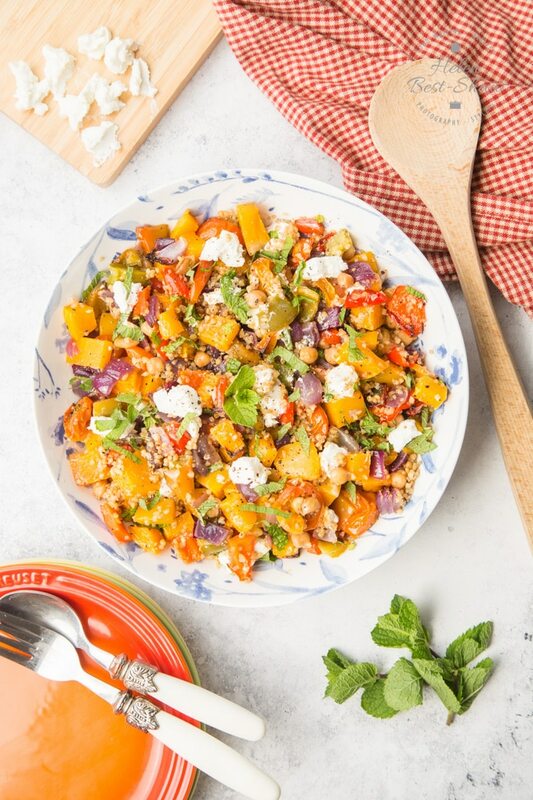 You’ll love this delicious, healthy and versatile recipe for grain salad with roasted vegetables, goats cheese and lots of fresh herbs. Adjustable and adaptable, it can be enjoyed at any time of year with whichever vegetables are fresh. It is perfect for picnics and packed lunches. Easily adaptable to be gluten free. Leave out the goats cheese for a vegan version and to make it Whole 30 and Paleo Friendly. Why make this grain salad with roasted vegetables with goats cheese? 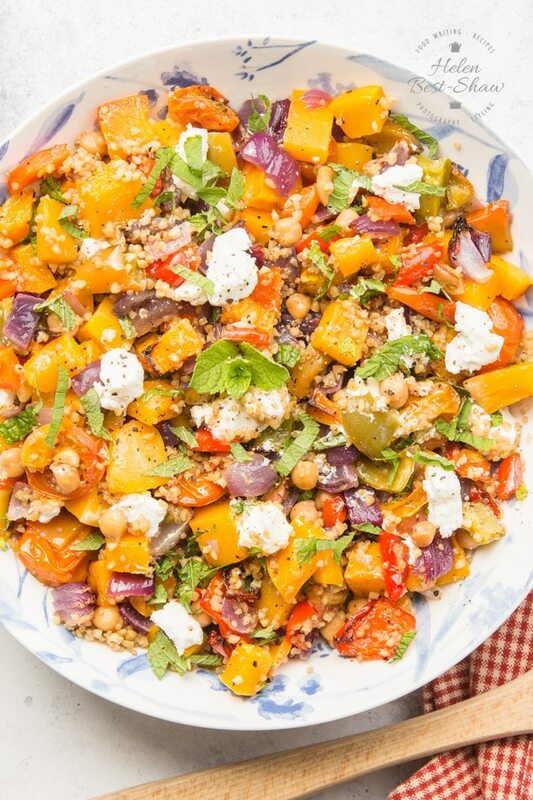 How do I make this grains salad with roasted vegetables with goats cheese? 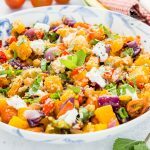 If you are bored of the same of sandwiches and jacket potatoes for work packed lunches then you will love this mixed grain salad with roasted vegetables, creamy goats cheese and lots of chopped fresh parsley. 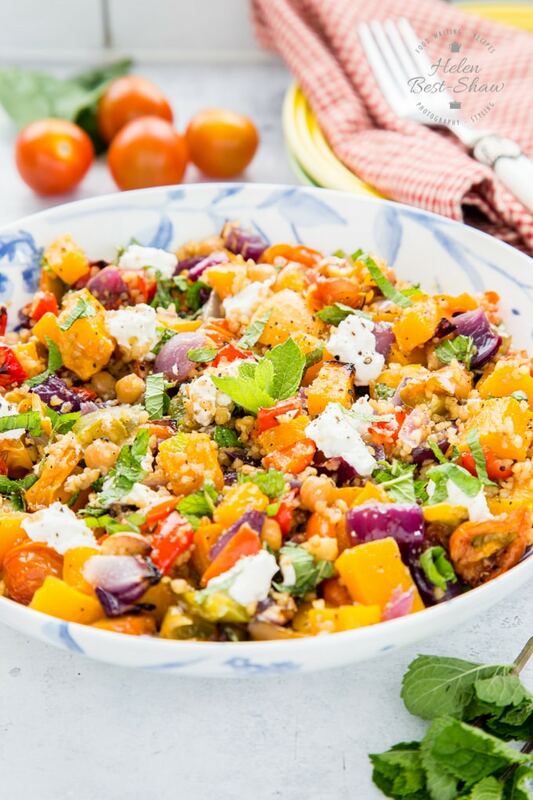 It is also perfect for picnics, I keep a tub of roasted vegetables in the fridge most of the time and I used a “cheats” packet of ready cooked mixed grains for the base of this salad. You can of course cook your own grains and mix it up however you like. I made these as part of a series of food on the go for picnics and packed lunches I’m putting together with my lovely chum Emily, A Mummy Too. 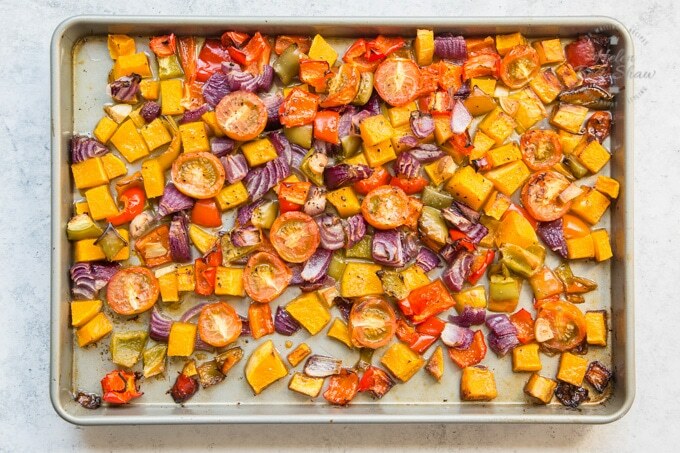 I love roasted vegetables, all you need is a quick peel and chop and they are ready to be cooked. I make a batch most weeks; usually on the evening before my supermarket delivery is due, to empty the salad drawer. Most vegetables will work well roasted including pumpkin and squash, root vegetables such as parsnips, carrots and beetroot; aliums – onions, shallots, leeks and garlic; bell peppers, try aubergines and tomatoes which cook down and release lots of juice which helps to make sticky sauce. If you cut them all small enough you can just throw them all together, drizzle with some olive oil, dried herbs, salt and pepper and cook. If you add soft and juicy vegetables such as tomatoes they cook down and make a rich sauce for the rest of the veggies. 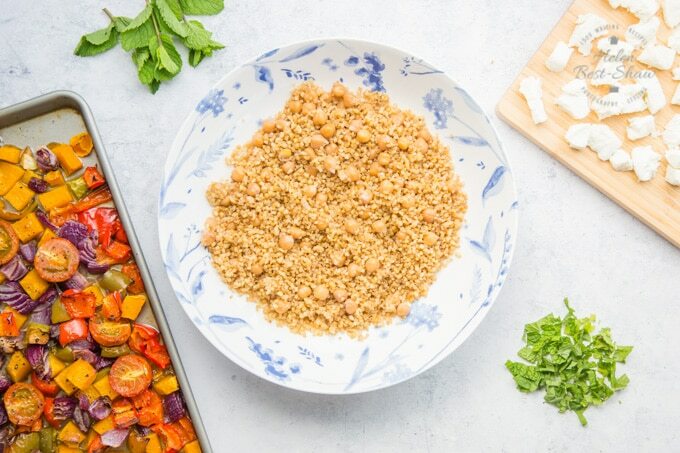 Serve your roasted vegetables in a grain salad like this one, added to a green salad to make it more substantial, hot as a side dish, blitzed into a sauce, on top of a pizza or whizzed up with some stock or bone broth into a tasty soup. The beauty of my weekly dish of roasted vegetables is that it is different each week as I use whatever is leftover languishing at the bottom of the fridge. Because it’s something different; it’s hearty and filling but not heavy, it’s delicious, and it’s perfect at any time of year, by changing the roast vegetables to whatever is in season at the time. Also, the vegetables can be cooked ahead, so you can assemble the salad in no time at all, making it perfect for when you need to be able to produce a meal in a hurry. It’s also healthy, loaded with vitamins A and C, the with a good helping of fibre, and low in cholesterol. 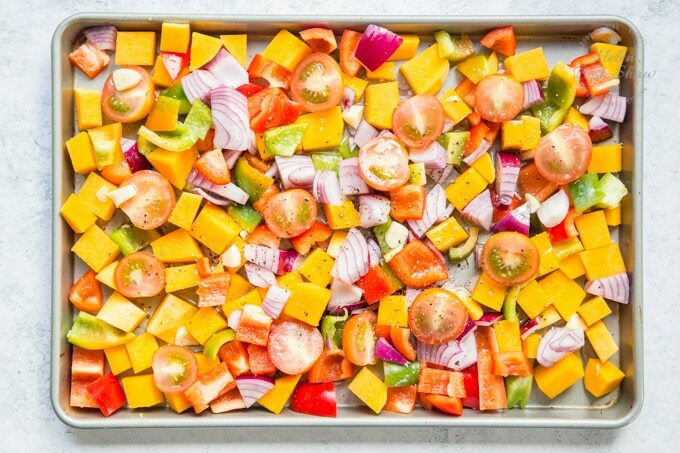 First, chop and prepare the vegetables – I used a mix of butternut squash, bell peppers of all colours, red onion, a few cloves of garlic and some cherry tomatoes all cut up to 2-3cm chunks. Spread them out as much as possible in your roasting tin; they will shrink, but better if possible to have everything on one layer so they roast, rather than steam and you get that lovely caramelization that makes them so sweet. Second, roast at 180C/350F/Gas Mark 4 for about 30 minutes until the butternut squash is cooked. Allow to cool. Roasting the vegetables is the stage of this recipe that takes the most time, but can be done ahead and the vegetables kept in the fridge overnight. Third, assemble the rest of the ingredients. The cheat is to use a packet of pre-cooked mixed grains, but you can of course cook your own. We frequently cook a batch of grains and then freeze them flat, on silicone mat, for later use. Here, I’ve used a mix of bulgar wheat, quinoa and chickpeas. For people eating paleo diets, there are plenty of ancient grains available. Fuss Free Tip – if you are making this as a packed lunch then add a handful of frozen chickpeas, they will keep the salad cool and be defrosted by lunchtime. Fourth, assemble your salad. Mix the roasted vegetables with the mixed grains and chopped mint, and stir together. The oil used to roast the vegetables will dress the salad. Top with crumbled goat’s cheese. This would also be lovely with some pomegranate seeds and dollop of my tahini dressing. If you try this Grain salad with roasted vegetables and goats cheese please tag #FussFreeFlavours on Instagram or Twitter. It is amazing for me when for me when you make one of my recipes and I really do love to see them. You can also share it on my Facebook page. Please pin this recipe to Pinterest too! Thanks for reading Fuss Free Flavours! A great prepare-ahead salad using roast vegetables and packet cooked mixed grains. Delicious, hearty but not heavy, and great at any time of year. Crumbled goats cheese adds a salty kick. Naturally gluten free depending which grains you use. Leave out the goats cheese for a vegan version and to make it Whole 30 and Paleo Friendly. Heat your oven to 180C/350F/GM4. Chop the vegetables into small, 2cm / 3/4" pieces. Spread out in a roasting pan and drizzle with olive oil and season with salt and pepper. Roast for about 30 mins until the butternut squash and any other root vegetables are soft. Once cooked allow to cool. Mix the vegetables with the grains and stir through. Make sure that all the oil used to cook the vegetables gets transferred onto the grains to dress the salad. Cut or crumble the goats cheese and dot onto the salad. Finally, chop the mint and garnish the salad, and serve. I get the best results when roasting vegetables when I make sure that all the vegetables are well coated in oil. The best way to do this is by hand - gently turn all the vegetables until they're evenly covered. I've used a pre-cooked pouch of grains, but you can also use your own mixture and cook them from scratch. I like cooking batches of grains, spreading them out to cool quickly and then freezing them spread on a silicone baking mat supported on a baking tray. I have assembled this salad with frozen grains which keep it cool and have defrosted by lunch time. Make this vegan by omitting the goats cheese. If you're eating a paleo diet, you can use suitable vegetables and ancient grains. This recipe is 11 Weight Watchers Smart Points.